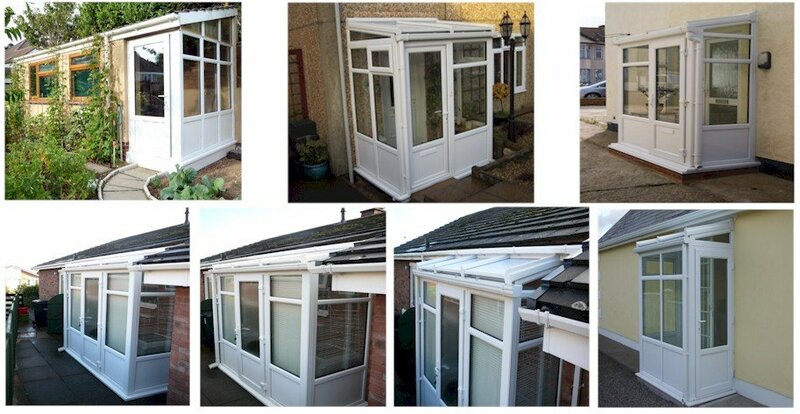 Our porches are manufactured in Bristol from the highest quality components and we will deliver directly to your home. Each component will come pre-numbered for easy installation. Please note we are happy to make any design porch to any size or shape to suit your property. 2.0m wide x 1.0m projection Lean To Porch. With full height, half glazed panels. As standard you will receive a variable pitch roof to support polycarbonate or glass. Ply-reinforced lower panels at a standard height of 600mm and 150mm wide cill Quality door furniture including hinges, lever..
2.0m wide x 1.5m projection Lean To Porch. With full height, half glazed panels. As standard you will receive a variable pitch roof to support polycarbonate or glass. Ply-reinforced lower panels at a standard height of 600mm and 150mm wide cill. Quality door furniture including hinges, ..
2.0m wide x 2.0m projection Lean To Porch. With full height, half glazed panels. As standard you will receive a variable pitch roof to support polycarbonate or glass. Ply-reinforced lower panels at a standard height of 600mm and 150mm wide cill. Quality door furniture including hinges, ..
2.5m wide x 1.0m projection Lean To Porch. With full height, half glazed panels. As standard you will receive a variable pitch roof to support polycarbonate or glass. Ply-reinforced lower panels at a standard height of 600mm and 150mm wide cill. Quality door furniture including hinges, ..
2.5m wide x 1.5m projection Lean To Porch. With full height, half glazed panels. As standard you will receive a variable pitch roof to support polycarbonate or glass. Ply-reinforced lower panels at a standard height of 600mm and 150mm wide cill. Quality door furniture including hinges, ..
2.5m wide x 2.0m projection Lean To Porch. With full height, half glazed panels. As standard you will receive a variable pitch roof to support polycarbonate or glass. Ply-reinforced lower panels at a standard height of 600mm and 150mm wide cill. Quality door furniture including hinges, ..
2.5m wide x 2.5m projection Lean To Porch. With full height, half glazed panels. As standard you will receive a variable pitch roof to support polycarbonate or glass. Ply-reinforced lower panels at a standard height of 600mm and 150mm wide cill. Quality door furniture including hinges, ..
3.0m wide x 1.0m projection Lean To Porch. With full height, half glazed panels. As standard you will receive a variable pitch roof to support polycarbonate or glass. Ply-reinforced lower panels at a standard height of 600mm and 150mm wide cill. Quality door furniture including hinges, ..
3.0m wide x 1.5m projection Lean To Porch. With full height, half glazed panels. As standard you will receive a variable pitch roof to support polycarbonate or glass. Ply-reinforced lower panels at a standard height of 600mm and 150mm wide cill. Quality door furniture including hinges, ..
3.0m wide x 2.0m projection Lean To Porch. With full height, half glazed panels. As standard you will receive a variable pitch roof to support polycarbonate or glass. Ply-reinforced lower panels at a standard height of 600mm and 150mm wide cill. Quality door furniture including hinges, ..
3.0m wide x 2.5m projection Lean To Porch. With full height, half glazed panels. As standard you will receive a variable pitch roof to support polycarbonate or glass. Ply-reinforced lower panels at a standard height of 600mm and 150mm wide cill. Quality door furniture including hinges, ..